For the first time in 40 years we painted our chassis two tone. I wnated the contrast and Dave Watson got it done. All the bolt on parts are either painted cleaned or replced. We will start assembly this week. What a week we had. Our crew of Jim, Dave, Jason and Perry worked hard on Monday and Wednesday to get ready for Saturday. Two of David’s crew came over, Marty and Dave, helping our team get a majority of work done on the car Saturday. We’re excited that things have gone smoothly so far. It was a huge commitment to strip the car totally and clean, paint or replace the parts that were put back on. It was like putting a model car together. The work we did was beneficial to my crew in understanding more about the car and how it went together. The picures on the wall were taken before disassemble so we would be sure to get the car back together exactly as it was when we stopped racing in 07′. A few changes include a new bolt on front sub clip that holds the nose and front bumper. All new shocks, seat belts and drive shaft. The old shocks and drive shaft will help fill our void spare parts supply. It’s taken quite a while to get some spare parts, hopefully we don’t need to use them. 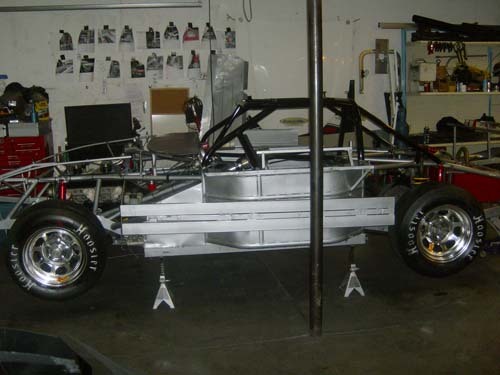 This week we intend to finish all the bolt on parts, mount the body, and take the car to Jim Sweers to have the body painted. Jim will remove the Monte Carlo shell, hang it up and paint it all at once. Then it’s back home to finish. We hope to have it lettered by the first week of February. Our crew has worked hard to get us this far. Dave Watson has done much of the welding and fitting the body, we are happy with the car. Jim, Jason and Parry have spent quite a few hours getting the chassis stripped, prepped and ready for paint. This week we drilled the rivet holes for the front and rear windshield and got the trunk lid mounted. We have a few more little things to do before painting and then we start cleaning and organizing our spare parts. This year our focus was completely stripping the car and putting it back together, a move that helped the boys get to know the car better. Another focus was stocking our spare parts supply which has been very low since we first started. We now have good bench strength for 2008 as we take a run a the Flamboro Points Championship. It is a little ironic that we now have many of the spare parts most commonly needed, yet to have a good shot at winning the Championship, we should still have them all, or most of them at the end of the season. 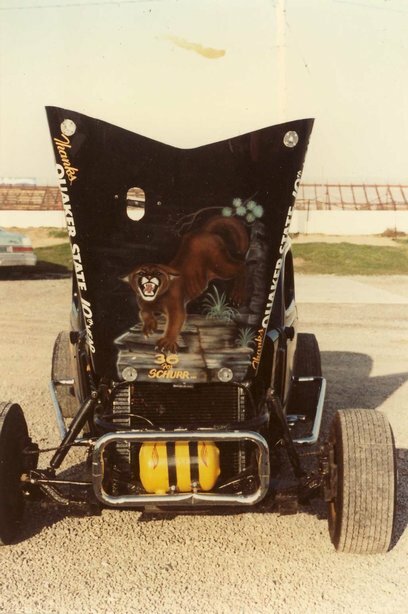 Judy Barrett air brushed the mountain lion on our hood. This picture in our 83′ history sums up alot about our racing. Chrome everywhere, Quaker State 10th year and “36 For Schurr” on the hood. There are quite a few pictures in 83, with lots more to post. On Saturday afternoon, at his home, Harry Bow, Nonies brother, passed away. Though he had been struggling with his health the past few years, he had mellowed considerably and was enjoying life with Joan his beautiful wife. Harry began his racing career in the Hobby class in 1973. It took him less than a season to win his first feature, in fact he won all 3 races that night. Harry moved on to Late Models to battle with Ontario super stars Don Biederman and Junior Hanley. There are many pictures in our CVM history, early years, that include stories about Harry. He certainly was a character throughout his racing years. He was a great help to me, always getting my car ready when I needed him, and that was quite a bit. 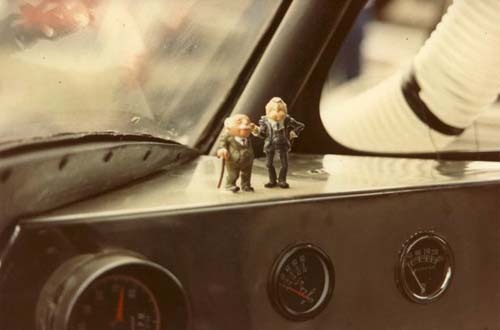 In 1978 he suggested that I race using two feet instead of one. I thought he was nuts and didn’t want to make the change. To my surprise and shock he took a torch and cut the brake pedal off my car so I had no choice in the matter. Screaming, yelling, cursing and fying beer bottles immediately followed. We made up before the sun went down. Our next race was Delaware and in the warm ups I almost drove my foot through the floor when I tried using my right foot as the brake. The pedal had been moved over to the left and my foot missed it completely. After a few weeks I started to get use to the change, I never went back to one foot racing. 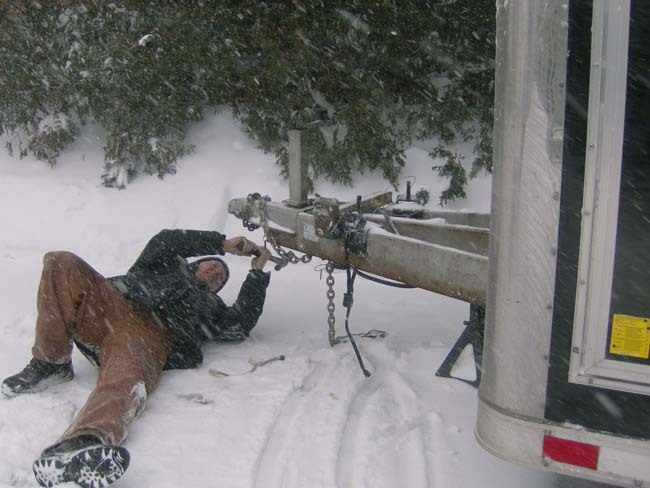 He had a great understanding of mechanical things, and the brake pedal move was only one of many he taught me. Harry will be missed. Our prayers are with his immediately family Joan, Nonie and Debbie, his daughter as well as his many friends and competitors. His funeral is Tuesday February 5th at Turner and Porter funeral home in Toronto at 2357 Bloor Street between Jane and Runnymede. Yesterdays funeral service for Harry, the husband, father, grandfather, brother, uncle, brother-in-law and friend, was filled with emotions both sad and happy. Those who spoke gave testimony of a caring, loving, generous man. There were four who chose to come forward and thank Harry for his kindness. His wife Joan was blessed to live with a mellow loving husband the past four years. Debbie, his daughter, was so glad the two were reconciled the past few years giving her a chance to thank him for helping her through some rough times as a kid. Debbies last words to her dad just two days before he died were, I love you. Danny, Harrys step son was thankful for the many things Harry taught him and Molly, Debbies friend saw a compassionate loving side of Harry when he reached out to her while she was a youngster and needed help. The one person Harry would not have expected to speak would have been me. We battled for years. He always tried to out do me. When he beat me he loved to laugh about it. No matter how much I tried to get one up, he always managed to get the last laugh. Though he grew closer to me the last 10 years he still found ways to get at me about racing or religion or both. He did it in fun, but found the exercise futile since I didn’t react the way I did when I was much younger. Though he wouldn’t have had any say in the matter, I’m sure Harry may have rathered someone else conduct his funeral service, but through the blessings of his wife, daughter and sister Nonie, (my dear wife) it was me who would act as clergy, an honour I glady accepted. I would end our relationship one up on him, but in a very positive way. How did Harry get the last laugh? At the grave side we concluded with the placing of roses on the casket. My daughter, Shirley, came over to me while we were still standing by the grave and asked me if I looked at the huge 5 foot marble headstone. I did look at it briefly before the final ceremony and noticed one persons life from 1878 to 1938 and thought, wow this goes back a long way. Getting back to Shirley, I answered her , “no, why”?. She said “take a closer look at the headstone”. My eyes started at the top and slowly fell as I read all those who had passed on. Then at the bottom was the shocker, something I never seen before. There, nicely scribed, on the final row of this giant monument was Nonies name with her birth date, and right beside her name was MINE. I was speechless and started to mumble so much I could hardly talk right. (good thing I had already finished the final words of the service). I felt like Scrooge when he seen his name on the headstone, definitely nothing I felt before. Nonie, very surprised at my reaction said, “I told you we already had our plot, Harry arranged it for us”. I said “yes, I know, but why is my name on it now, it didn’t need to go on it already”. Anyway we laughed as we drove away from the graveyard and I thought, “Harry, you got the last laugh”. We’ll miss him. In our CVM History section, 1983, this picture is there. I put out a request of the name of one of these two grumpy men (my favourites) on the Muppett Show. I remembered Waldorf. The other day one of David’s crew members, David Lewis, called me letting me know that Statler was the other member of this funny duo. 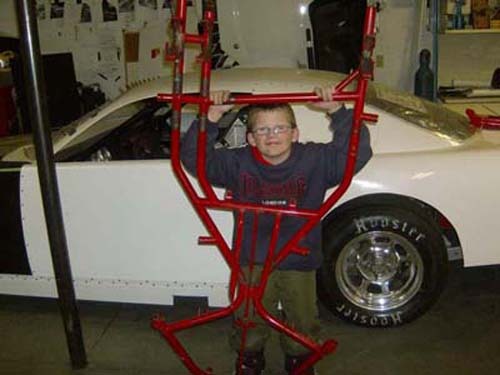 We want to get the go-cart painted with the Late Model and Gehrig and Lauren worked on the car a few weeks ago. The past few nights Gehrig spent more time getting the cart stripped completely. After it’s sanded it will be ready for paint. It was different taking this apart with my grandson, and hopefully easy to put back together. We were working on the body Wednesday night at Jim Sweers. While we were sanding the panels he noticed my method. “Hey, you’re not waxing the car, don’t use a circular motion”! He showed us how to do it properly, and we went nuts. It was an incredibly bitter cold night, one that makes you want to start on the car a lot earlier in 2009. Anyway, Jason and Perry helped get the car ready for paint and then with the help of Randy, Pee Wee and Larry, Jim had us all carry the one piece body into his paint shop. The one small problem, okay big problem we accidentally caused Jim, (in my 40th year, I’m still accidentally causing grief somehow) was when we painted the chassis silver. We should have taken all the body panels out of our garage. “What’s this”? Jim asked. I wanted to say fog, or snow, but both of them would have went away in seconds. Now he has to figure out how to get the silver overspray off the rubber bumpers and fenders. One thing for certain, we continue to learn what not to do. Over the next 40 years perfection should be on the horizon. Jimmy Sweers finished the paint on our car and he did an amazing job…again. The Monte Carlo is now at the sign shop, should be done by Tuesday, and we may just take it from their shop to the car show. Please…no more snow..no more -10. Meanwhile this is the last picture taken of our 2007 Charger. The floor makes me think of putting those glow lights under the car, wouldn’t that be awesome. Imagine, Late Models with under chassis lights…that may go over better than a CVM with a V8 Crate. Imagine that too, World Of Outlaw Coupes. Last Thursday I dropped the car off to be lettered. Once the car was inside I hurried out to move the truck and trailer because it was blocking other cars, though no one was leaving at that time. In my haste I pulled away with the trailer jacked up. Naturally the jack broke. When it broke off it bent and twisted the bottom part of the jack that has to slide up through fairly tight squared slots. So, here I am whacking the steel to get it straight enough to remove it. Naturally I need it fixed to get the car back in the trailer Wednesday to take it to the show on Thursday, and naturally my best time to remove the broken jack is on this snowy blowy Saturday March 8th storm. Snow blast number 47 for 2008, they say we’re deep in gloabal warming. I’d say more like another ice age. Anyway I was deep in snow because of a mental lapse that just proves nothing changes after 40 years. Many of our crew and friends came to help this week end. Special thanks to David’s crew for setting up the display giving our sponsors some excellent exposure. Pictured here from left to right are Perry, Leanne, Jason, me and Jim. Leanne came down to help out, she may drive our CVM a few nights in 08′. Special thanks to Perry and Karen from Embroidme in Burlington for making our excellent crew shirts. 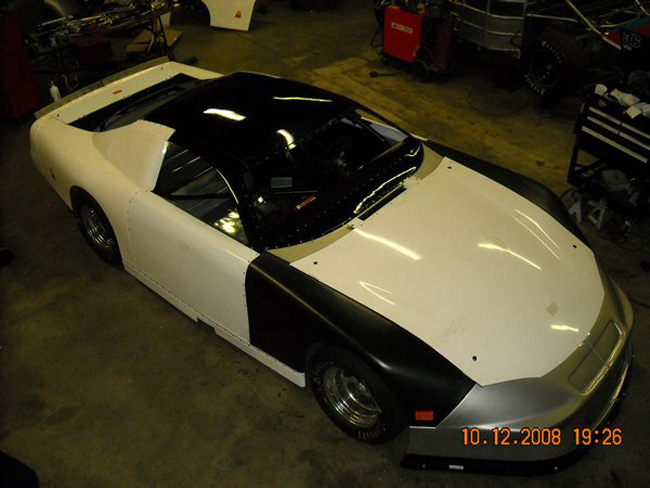 This paint scheme isn’t totally new, many cars have had a black and silver combo, however it was new for us, with the exact layout panned last summer. Nonie and I talked about it and wanted to go in this direction to do something special for our 40th year. It’s one thing to have an idea, but a totally different deal to bring it to completion. Many people helped accomplish this dream. 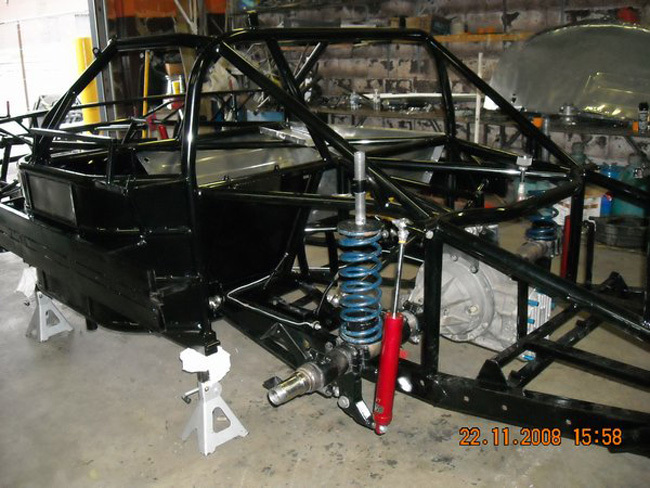 Dave Watson painted the chassis and roll cage. We wanted a two tone cage. It was more work and more time but Dave got it done. I really appreciated Jim Sweers taking the time to do the paint lay out. He was the next step in the assembly. Jim, could have easliy tried to convinced me to go with all black to get it done quicker but he was willing to spend extra time to do it the way we wanted. Also, Jim, Irene, Mike and Jeremy of Oakville Sign A Rama took enough time and patience to finish it off for the car show. They were very professional and had the same desire as our entire team of getting it done the way we wanted. The numbers were created by Steve Lyons for 07′ and we couldn’t resist using them again in 08′. All of these people and our crew of Jim, Jason and Perry encouraged us throughout the entire process. We were very fortunate to win Best Stock Car, a tribute to everyone who played a part in this project. We have bikes sponsored by all our sponsors in 2008, as well as David’s team. A team that always helps the racing business, #82 Jason Shaw, also sponsored a bike for our “Giving Back Tour”, in fact they were the first to come forward for us. What happended today was totally unexpected. A web site has been created for churches, or anyone else, to buy on line tickets for the July 26th special event, 40 lapper. Ben Robinson, senior editor for the Evangelical Christian magazine, is going to do a story on our team and promote this special race in hopes of getting a thousand extra fans to Flamboro. His book has a 20,000 mostly Christian audience. When I checked out the site www.40yearsofracing.com a picture of Jeff Stewarts car was used to promote the race. I didn’t mind, but I was worried that Jeff might. I called to ask if he was okay with a picture of his car being used this way on the site page, and he was more than agreeable. After explaining to Jeff about our 40th Anniversary and that we were giving a bike away a night, he asked if he could sponsor a bike, then within a few minutes made it three bikes for the kids. So to Ed Stewart Equipment, and all those who have helped us we are truly thankful. We were invited to speak at the Stanley Avenue Baptist church men’s breakfast this past week end. It was a beautiful day. This was our 5th non race appearance with our car since the 2007 season finished. Four of the five events involved a church speaking engagement, and of course the other was Performance World. Located in downtown Hamilton, this well established church has been blessing the community for many many years. Our next outing is on April 27th for the grand opening of our new sponsor location, ABIS Dental Group in Milton Ontario and then we will be involved with Barton Auto Parts special show at Mohawk College on April 30th. After that I think we go racing if there’s no more snow and not too much rain. Let Me In The Garage!!! We thought our little friend was sold to Jim and Josh Korenyi, but they decided not to venture into a full time season with the CVM. In such a short time of racing they spent $3500 on Buzz N Blow (we also spent $3500) and found that expense to be far too much to race in any class. Josh was good with the car but spent more time parked with inline worries and the experience wasn’t so much fun. We bought the new tires they purchased in 07′ as well as some other spares to add to the many we already have. I was thinking if there was anyway I could get a Volkswagon and paint it like our 1971 scheme, we would have a racer from every era we raced. Our grand children want to give go-cart racing a try and maybe if the CVM is still here in 2012, they will get to race it as well. Gehrig will be 10 and Lauren 9 by mid July, meaning that Gehrig could race in 4 more years. Wow. Meanwhile the Coupe, who once dominaetd our garage,(and Buzz N Blow..the engine…who dominated our wallet) parked next to the #37 Coupe of Davids, has been demoted to outside parking. David’s Monte Carlo can be seen in the back ground and has no intentions of moving over. 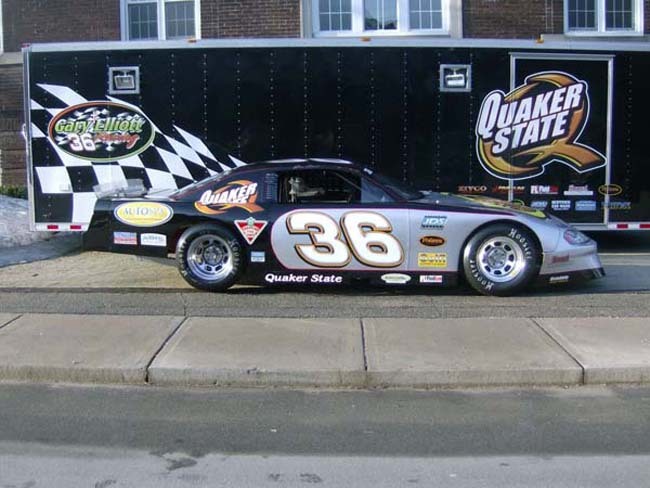 We removed all the decals on the car but the Quaker State and Star. Sort of ironic because, for now, the little Coupe sits under the stars with a tarp on it at night. Leanne Ruelens will pilot the black Knight a few times in 08′ and of course I can’t wait to run with the CVM boys whenever I get the opportunity. It’s just a hard thing to part with this historical part of our family. 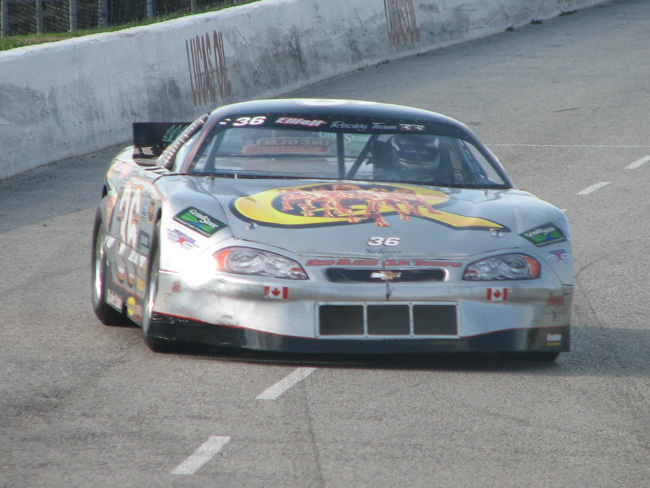 On our season opener at Flamboro Speedway Saturday night, the results showed we didn’t have much in the way of teeth to get a good bite on the comptition. However, we did survive and were able to take our car to our newest sponsor, ABIS Dental Group, grand opening in Milton, where fixing teeth is their specialty. Mark and Agatha have another location in Oakville and are planning to have a new store next year in Waterdown. Please support our sponsor for your dental needs. Hey Coupe Get Out Of The Garage!!! 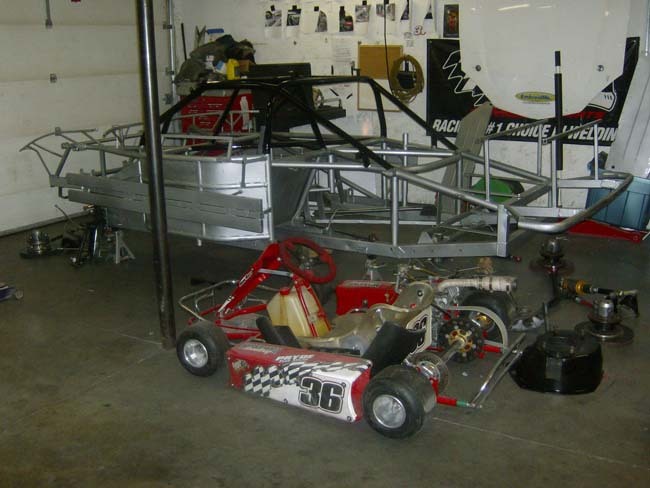 The Kid, the Kart and the Coupe were all in the garage leaving no room for our Late Model. We actually needed to fix the CVM clutch and wanted to do that in the garage. Meanwhile the rear bumper and frame were bent and had to be fixed on the Late Model. We got all of the rear damage repaired thanks to both our team and Eddie, David’s crew chief. We’ll do our maintenance for this week end on Wednesday night. Since 2005, Jesse Pontello and Josh Korenyi have driven our 33 Chev Coupe to support the CVM. Jesse is now racing a Late Model at Delaware Speedway and Josh will be racking up more wins in his “Shifter Kart”. In 2008, Leanne will race a few nights and if arrangements can be made, I will race the car in the Twin 25′ and our special night July 26th. Leanne impressed me a few years ago when she drove in the Ladies Powder Puff race. She was agressive and stood out in that run. It’s a huge leap to compete with so many strong running veteran CVM racers but we’ve mandated that Leanne do this for fun and improve the best she can each week. She turned 5600 RPM this past week end. The tach will be our guide to see her progress. I must admit she is quite brave. Her street car is a Mazda, maybe 100 hp. When she mats the throttle on the Chev Coupe, she will increase the speed as the 300 horses kick in, as well as her heart rate. She was incredibly excited to run the car this past week end. We’ll send it out to Steve Lyons for lettering next week. The Hobby’s are off next week end giving Leanne an extra week to prepare for her second night of racing. After wrecking so hard Saturday in the heat race we needed to make sure everything was okay. We bent the motor mounts, ball joints, all the mounts on the frame and some suspension parts. It made for easy access by taking the body off and the engine out. 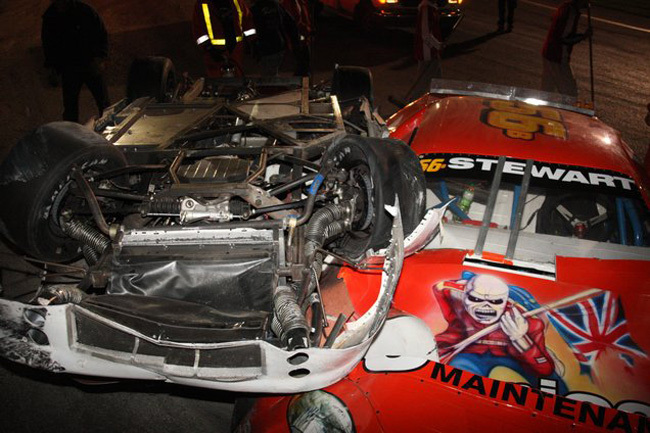 Our wreck on Saturday was the worst ever in Late Model, mostly because of the side impact. It was good to get back out in the feature after the wreck to see if whatever happened would show up again, not that I wanted to slam the fence again, but to determine what caused us to hit so fast and hard. Running the feature proved there was nothing wrong with the car, other than the bent stuff. After talking to David on Sunday and comparing our car weights with 2007 ntoes, we concluded the cause of our wreck was from a very severe loose condition compounded by driving in hard and hitting the brakes, making the car come around even faster. Loose anywhere is not good, but on entry it’s dangerous, a remedy for disaster, and our team learned a lesson, the hard way. The boys worked hard again today and we should have the car finished by Thursday, but for sure for the week end. We have a show to do this Wednesday at the Rock River Congrgation in Mississauga, Bruce Smith’s church. The children are looking forward to us coming and we didn’t want to let them down. There is a classic car show in the parking lot and we were scheduled to be on display in front of the church….and we will….with the Pennzoil car. It’s on the North Service Road between Cawthra and Dixie Road. If you’re in the area drop by. Rebecca Easton came to Flamboro Speedway, with her dad and mom, to watch her uncle Ron Easton race his new Vintage Modified Coach. Ron wasn’t so lucky in his race, but Rebecca came home with a brand new bike. Congratulations to Rebecca, we wish you a very safe summer riding your new bike. The struggles we had all season came to a head last week with our heat crash. Hard work by our dedicated crew this past week not only got us back, but to the winners circle. Our turn around started on the holiday Monday when we stripped the car down to make repairs and go over the car thoroughly. Perry, Jason, Troy, and Dave Watson helped get the car ready. On Friday night Thatcher came over to help us scale the Monte Carlo and give us the simple steps if we had to make any chassis adjustments at the track. We did make a few adjustments and after some hot laps we were set. Our team efforts resulted in our first win and a 2nd place finish in the feature….and not a mark on the car. The night was special because David won his heat and won the feature giving the Pennzoil Quaker State team a clean sweep. 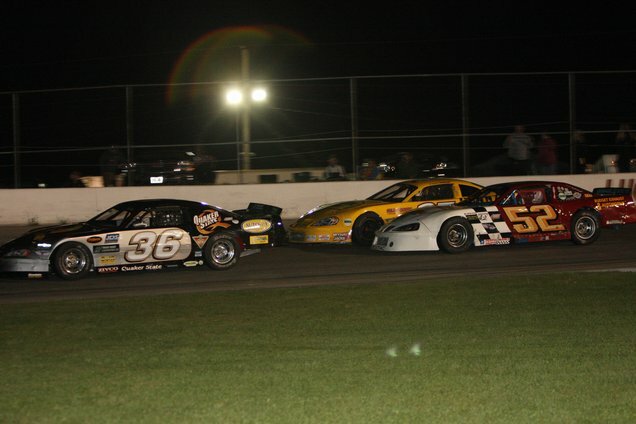 May 31st we head to Sauble Speedway for their first ever 150 lap race. David will not make this trip, he will be at Flamboro Saturday night. 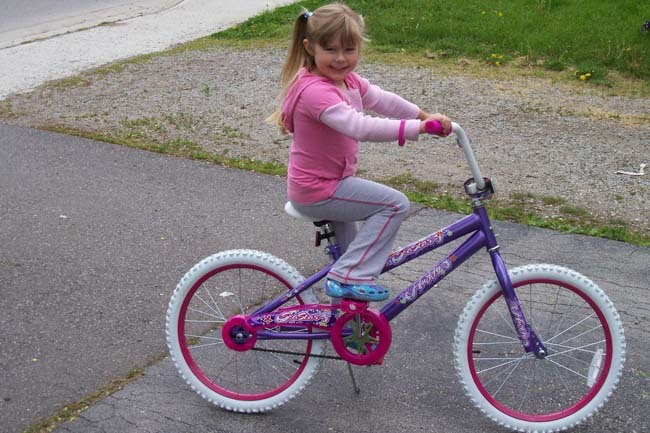 We will give a bike away at both Flamboro and Sauble this week end. 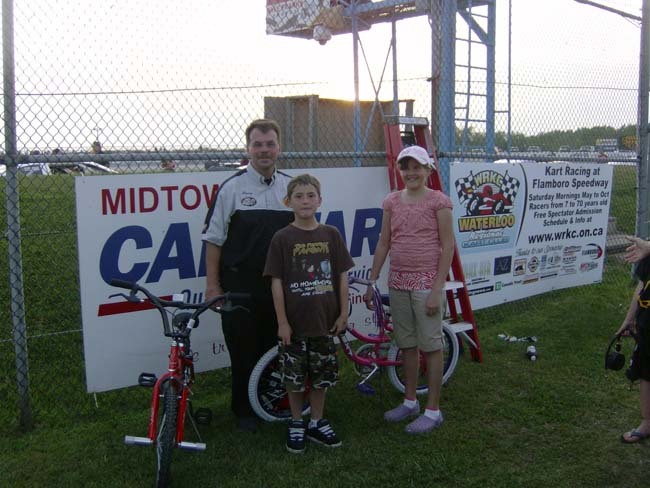 On June 7th at Flamboro Speedway, a pair of bikes were given away to two young race fans. These bikes were sponsored by Perry and Karen VanHaaren of Embroidme Burlington. Perry is pictured here with the kids and we’re sorry we don’t know their names. Congratulations to the young ones and thanks to Perry and Karen for supporting this effort in celebration of our 40th year racing. Last night (June 13th)we watched the Cogeco Cable TV footage of the Grisdale Triple Crown race on June 7th. What we expected to see was David’s car leaping into turn three and making hard contact with our car. That was what I felt sitting in the car, that he drove into the back of our car. After watching the taped race, Nonie, our daughter Shirley, Leanne Ruelens, our spotter Jim and me, it was clear to all of us, that David got a good run on us coming off turn two and for the first half of the back chute he was at our quarter panel but near the end of the straight he was up to our rear wheel. Jim said right after watching the incident “I should have made the call”. The call he was referring to was “car low”. There is more on this than just the no call, a bizzar twist that made things much worse. The whole story and exoneration of David is on our site message board. To David and his crew….”we apologize for putting you through so much grief after the race”. This mess was not your fault. For the past two weeks we’ve had problems in the feature. In both races we were running in the top three and were involved in a wreck. Now we are worried that bad things come in three’s. If they do, we’re in trouble this week. So my advice to all our competitors is to stay clear of us. Maybe the best thing to do is to let me get way ahead, that way you’ll be safe. We are considering putting a Fire Truck sign on the back of our car, ‘STAY BEHIND THIS VEHICLE 150 Feet’. If we finish in a good spot, like first, the curse will be lifted, then we all can go back to normal for June 28th. I know this is a rare request, but let’s try it for one week. Delaware Bound….Bring An Umbrella? NO! We survived last Saturday night, and no, we didn’t get way in front like we hoped. We did however, get way behind, which can be just as safe and managed to avoid one huge wreck on lap 9. Anyway, we are in good shape to head to Delaware Speedway for the Part Source 141 special. 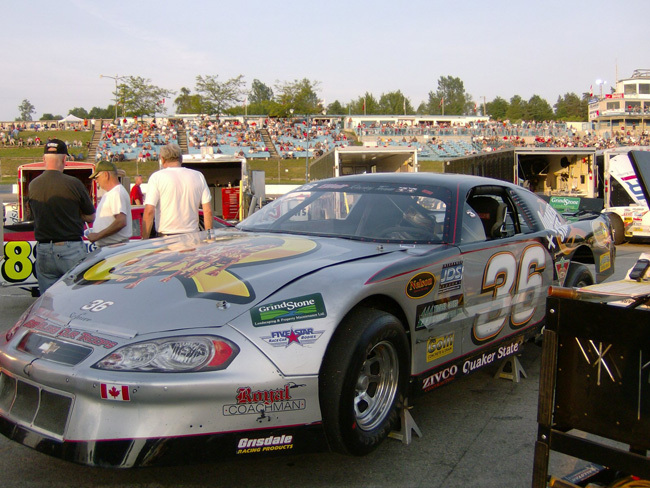 It will be our 2nd big race of 08, the first being the Sauble Speedway Margarita 150. The weather man is calling for some wild weather…intermittent tornado’s with occasional forest fires…okay, not that weird, but it seems as we approach every week end we are warned of the pending wash out for Saturday and Sunday. It must drive baseball players, golphers, bar-b-que people…oh ya, and racers..nuts. The cottage people don’t care about the weather anymore, they have the constant increase of gas that has them in a frenzy. Racers don’t care about the gas, not when new tires, and the chance of severly wrecking your car are your biggest costs to avoid. We are ready to go for Friday, if it rains we’ll be ready for Saturday, if it rains the rest of the year, we’ll be ready for the Sanat Clause parade. Over the years we have been frustrated by the inconsistancy of weather forescasts. This past week the reports were up and down like the stock market. As you can see by this picture the weather turned out great and no rain showed up until the race was over, our maintenance was done (that’s right, our crew changed the oil/filter, gears and a nut & bolt check) and the car loaded. We didn’t burn up the track but we ran better than the last time we were here with an 11th place finish. We were happy with the fact we ran okay and came home in one piece. Read the full report on our Message board under the topic “Diary of A Season”. After the Delaware 141 Jesse Pontello and I gave each other Hero Cards. Maybe one day I could be working for Jesse, you know, sort of like, “the changing of the guard”…but words of wisdom to Jesse…”be patient”. 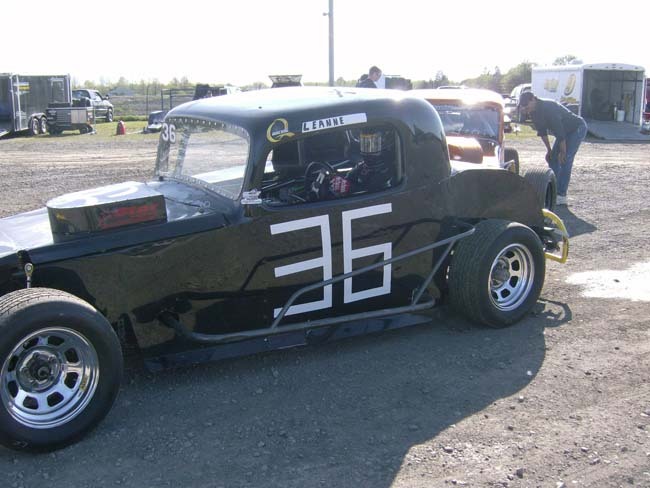 In 2005 Jesse drove our CVM, picking up some good finsihes and his first ever checker flag in a stock car. 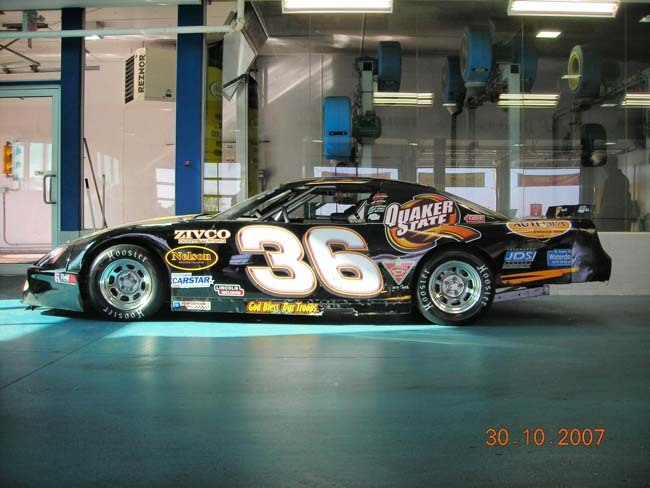 This past winter he made the move to race a Delaware Late Model. On Friday June 27th Jesse and I got to race against each other for the first time. This coming Saturday we’ll get to do it again as he brings his blue Monte Carlo #88 to my part of the woods, Flamboro Speedway. There are many young kids in racing today, none are more polite or friendlier than this youngster. All of us at Elliott Racing, wish him and his family a most exciting and fun filled journey in this awesome sport. Over the years with the CVM, Elliott Racing Team donated one bike to be given away through various Kids Clubs at the tracks we visited. This year however, to celebrate our 40th Anniversary, we made it our goal to give a bike away every night. The only thing we didn’t expect was how happy the kids were going to be. We had a good idea they would be excited, but not like this. Last week we were asked to come on the track to present the bike to winner. This young lady was very excited, though a little shy, at winning this beautiful bike, donated by Timber Green Landscaping. Almost half of the bikes have been sponsored and we are grateful to all those who helped with this special endevour. On July 26th we will be giving away 5 bikes, as well as our 40th Anniversary souvenir program. I can’t believe I agree that losing tonight to rain is a good thing…but it is. We have a lot to do this week to prepare for our Giving Back Tour night, and the last thing we needed was extra nights working on the car. Even if we won, there would be at least one full night going over the car. Right after it was announced the race was cancelled, we took the car to Jim Sweers for a face lift for next week. He is going to paint the silver and do some other touch ups so the car looks awesome for our fans and sponsors. All the maintenance is done. Now we can concentrate on decorating the building in turn one, setting up tables, tents and making sure Gerry and Josh know what’s going on so they can help make the night even better. So, as hard as it is to admit…a rain out could not have come at a better time. What a great honour it was today to be with these two Christian men on Huntley Street. Norm, in the middle, is an enthusiastic fan and Reynold, son of David Mainse, was tremendous with his questions and interest in our sport. They showed some video footage of both the Late Models and CVM while asking me questions, as well as still shots of both classes. 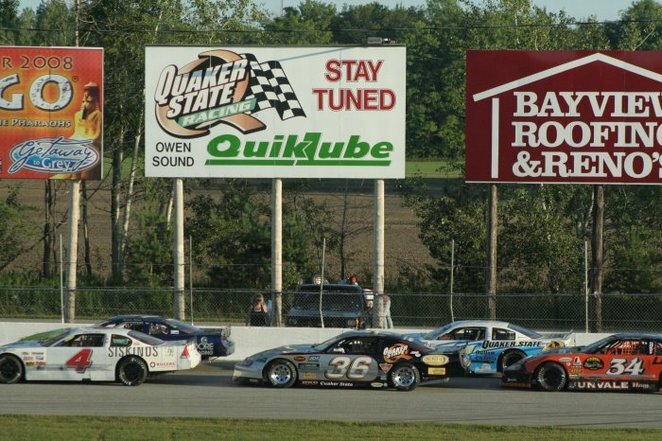 We promoted the July 26th race at Flamboro Speedway and hopefully many new fans come out to this event. 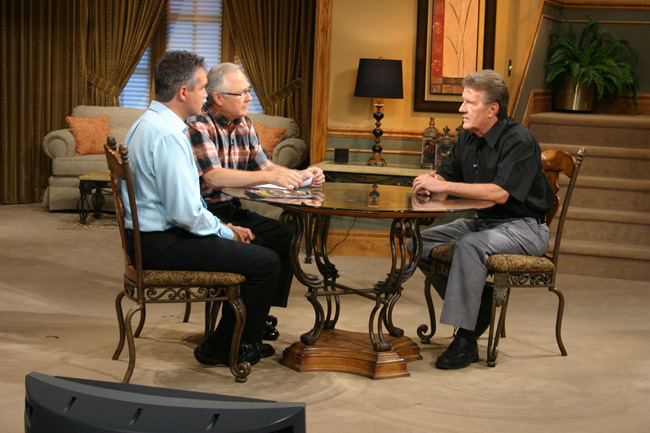 The most important aspect of me being on this show was to talk about racing but, more importantly my faith in Jesus Christ. You can see this TV show tonight at 9:pm or later at 1:am in the morning. We were so focused on making sure all the Giving Back Tour plans got done, we never thought we would be celebrating a victory. The season has been up and down at best, though we’d been running strong lately. To hope it didn’t rain out, that people would come, that enough Late Model drivers would be out, that all the food and books and bikes got presented in the right way at the right time was our main concern. To hope for a win was not even on the agenda, and when we got it we went nuts. Nonie, our crew, our sponsors and fans must have thought like I did, “pinch me, this can’t be real”. Taking the checker with David second was unbelievable. This was by far our most meaningful win, and we thank God for sending us so many great people to help us, and be part of this memorable night. 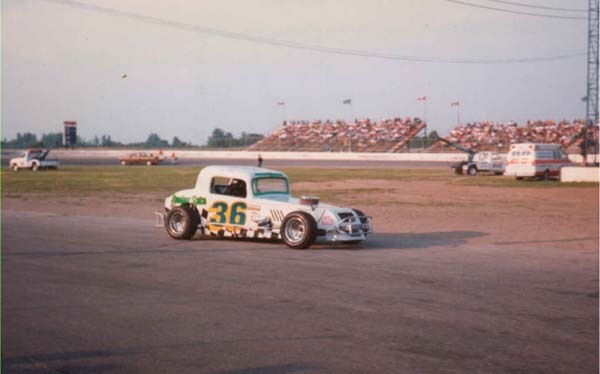 My race hero as most of you know was #36 Glen Schurr. Last week we celebrated our 40th Anniversary night and we’re proud to have in our pits,3 of Glen and Mary’s grand children, Sydney, Julia and Fayth. 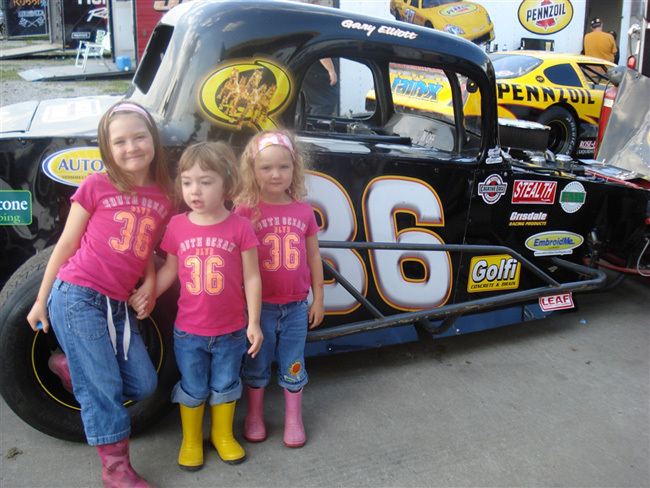 Here they pose with the 33 Chev Coupe prior to the races………….we are racing Flamboro tonight and hopefully it does not rain, because the rain date is tomorrow but we are heading to Sauble first thing in the morning for the Quaker State 100. After our win on July 26th and Saturday nights exciting 2nd place feature finish, we were on a run of many blessings. It’s true I love running at Sauble and we usually do well there, but what happened in the feature left us giddy and dumb founded again. We qualified outside pole with a 3rd and 1st in our heat races. 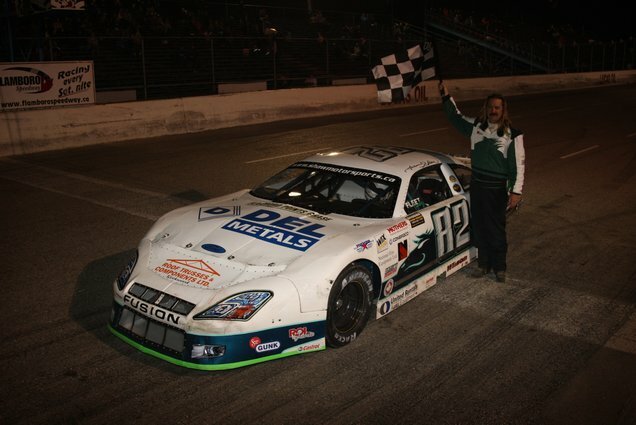 It was our first Late Model win at Sauble. Johnathan Urlin started pole and would go on to win the Quaker State 100. We would have our best finsih ever in a big race crossing the line in 2nd place. Nonie was spotting for me, Jim had to work as did Jason. She was amazing with her info and kept saying from lap 25 that we had a strong car and just had to maintain our pace to get 2nd. With 8 laps to go, the final caution came out and she started crying tears of joy. She said “you’ve got it, your going to finish 2nd”. Her play by play was awesome, coaching and talking to me every lap. My spotters never tell me how to drive only where cars are on the track and if cars are inside or outside. Nonie and Jim give such great detail, I can almost picture the what the race looks like from the grandstands even tough I’m in the car. 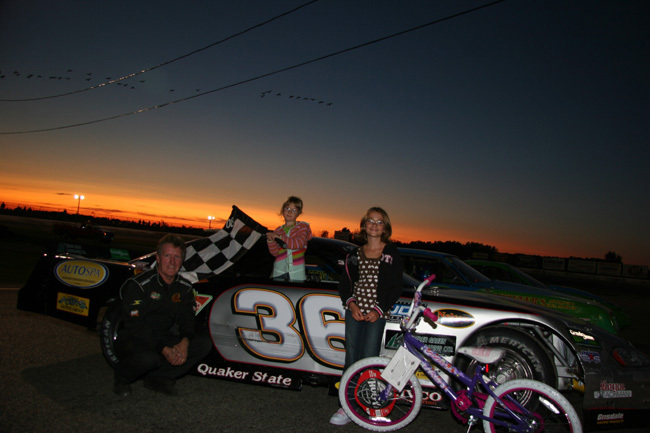 What a night for us to shine with Quaker State sponsoring the race. Thanks to all our crew and sponsors for giving us this opportunity to run competitively….also congratulations to Jonahtan Urlin for his win, and to Ron Sheridan for racing us hard and clean. There should be a new word for the rain we’ve been having. It wasn’t rained out today, it was “flooded or deluged out”. 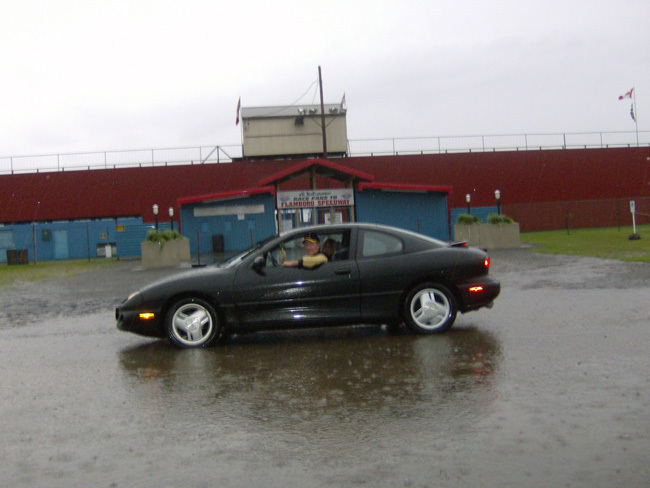 Can’t remember ever seeing the fields and parking lot at Flamboro this wet. Even when we headed to the track to check it out, we saw ditches and fields flooded like never before…and it dosen’t look like it’s going to stop any time soon. John and Frank only have so many days to make money in this business, we feel bad for them. Sunday is suppose to be the Rain Date, but the forecast shows a rainy day. Even if it’s hot and sunny, no one will be able to put there car in fan parking area because of the huge massive rain created ponds. Rain is good..too much rain is no good…this is no good. Hopefully next week is dry. When we left there must have been twenty thousand Sea Gulls sitting and flying around. I’m guessing they were waiting for the fishing boat to return. It was a fun day on Saturday before the races, that included a photo session with Sadie. However, what happened 9 hours after this picture was most disappointing. We will survive, and be ready for the double header this week end. Meanwhile Sadie is making sure no more damage comes to the car….you do not want to mess with this pet. This past week end we ran the final race of the Grisdale Triple Crown. Paul Howse won the series followed by Scott Lyons and Mark Burbridge. We missed the podium by ONE point. David was 5th in the three race event with his awesome 4th place finish on Sunday. 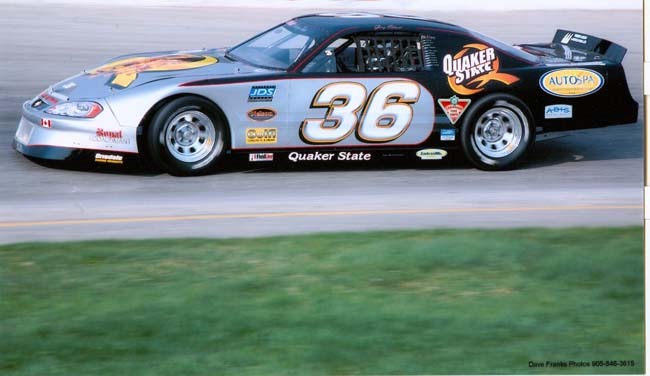 It was one of the wildest and most exciting Late Model features in a few seasons. 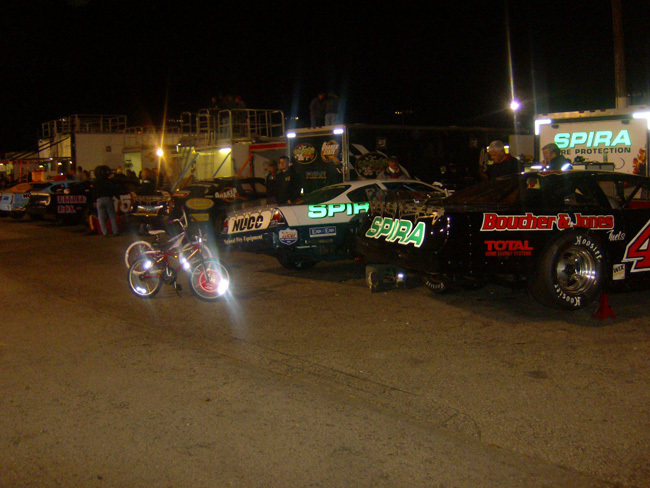 Scott Lyons #52 finished 6th in the feature but took runner up honors in the mini series. 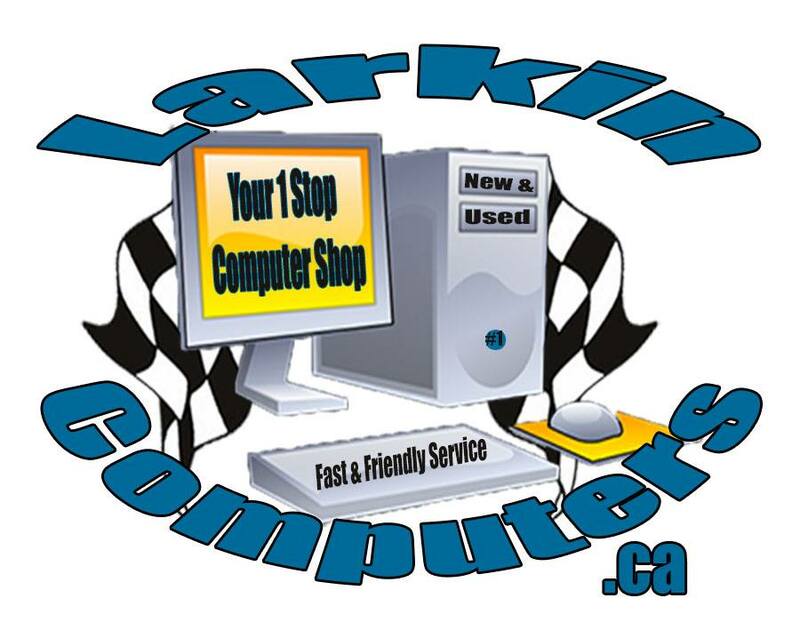 This week end, we’ll be at Flamboro for regular racing and fan appreciation. Then on Sunday it’s off to Delaware for the biggest race of the year. 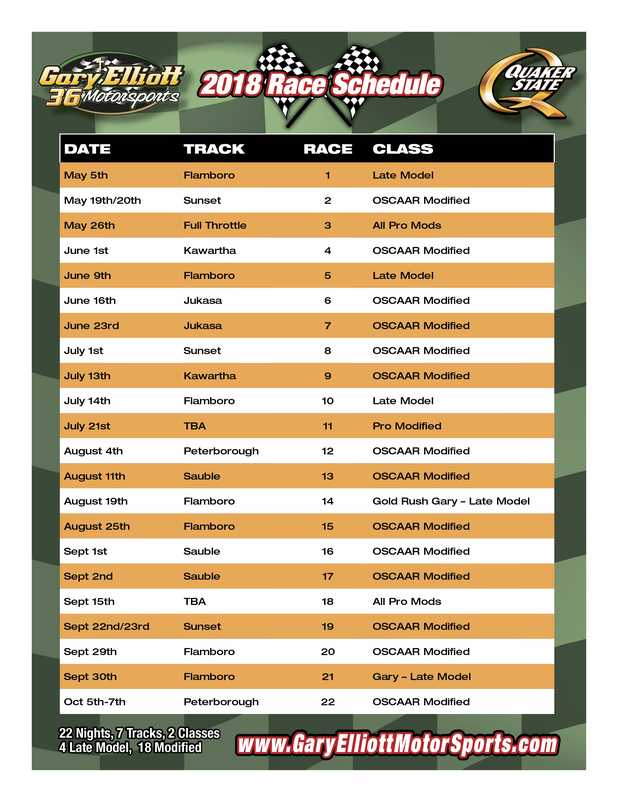 There should be 30 to 40 cars, it will be our first ever 200 lap race….200 laps, when I think about it, it seems like a lot, and why am I doing these big races now? 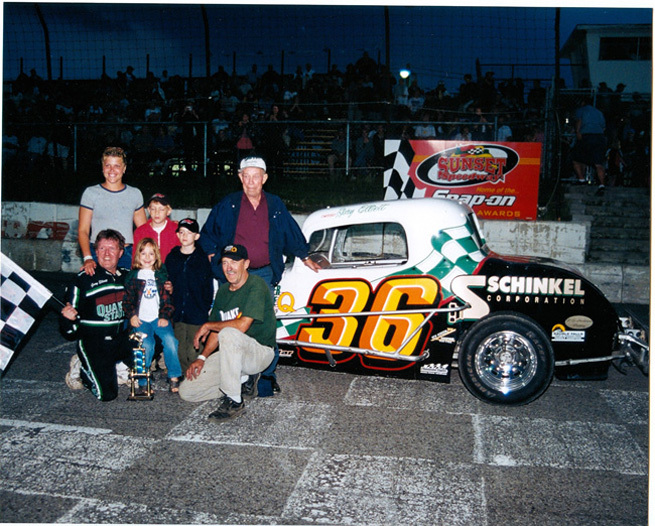 We ran 150 laps at Sauble May 31st, 141 at Delaware on June 27th, then another 100 at Sauble August 3rd. I know, soon I’ll be able to do the 500 lappers and surely someone from NASCAR will draft me…before it’s too late. A few months ago Pastor Betty and Michael Zita (far right) asked Nonie and I to bring our car to their church to support a community event called Rally Day. I had an opportunity to share both our passion for racing and my faith. After the service was over, there was an autograph session and then some gathered for this picture. A few men of the church, acting, John, Dave and Art, acting as our pit crew away from the track, helped us set up the tent. Art, second from the right, brought his 71 Chev truck. It started raining shortly after we arrived, so putting the tent up was a necessity, keeping our car and Art’s truck dry…..last night at Flamboro, during our pre race prayer time, we asked for protection for all the race teams and our race car, knowing that we were taking it to church on this Sunday morning. After the race, we prayed again, giving thanks to God for a great night but mostly for keeping us in one piece. 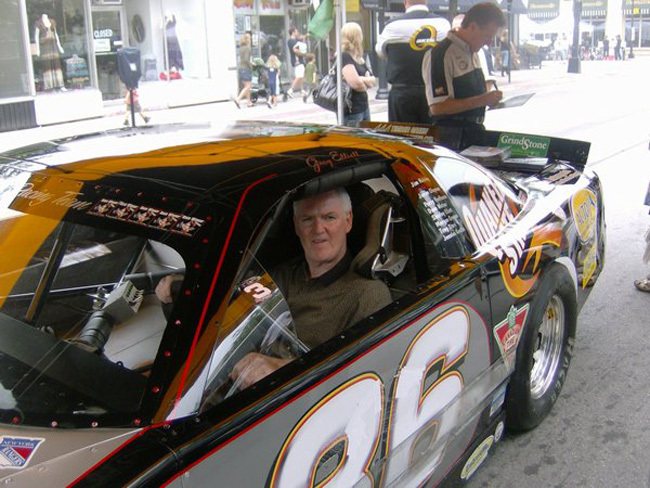 We need to do the same next week end, we are going to Central Gospel Church in St. Catharines to be part of their big day with hot rods and race cars. Yes we will be praying for protection for all those at the track, but a special request to protect our car again. It was an honour to have my picture taken with this young lady, winner of the bike this past Saturday at Flamboro Speedway. 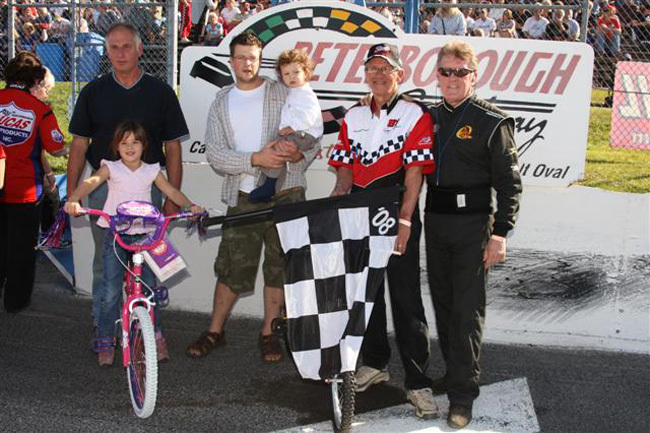 Her younger sister didn’t win the bike, but she got to stand in the car and hold the checker flag. We will continue giving bikes away for the remainder of 2008. On the Octoberfest weekend there will be four bikes given. Two by the Burbridge family, the owners of Late Model #27 and the other two by the pit crews of both Elliott Racing Team #37 and #36…this Saturday we will be on display for Quaker State in support of the United Way. The event takes place on Brant Street, starting at 10:30 am. There is lots to see and do so come on down. “I Just Hoped Your Boy Drove Like You”! This was a fun day for us, with many folks dropping by to say hello, get a picture and in some cases have their children sit in our car. Our crew, Jim, Troy, Jessica, Jason and Stephaney came to this Burlington United Way event on Brant Street. The weather wasn’t the best, although it didn’t start to rain until 2:30 pm. 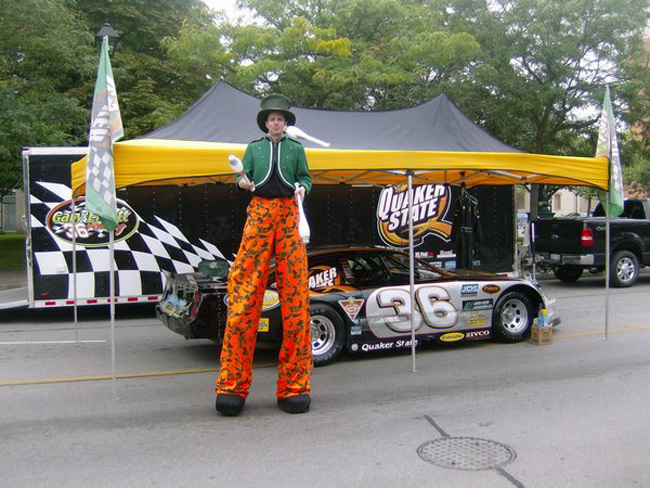 We will be doing more shows for the United Way through our sponsor Quaker State….by the way, the giant juggler couldn’t get in the car….and the worst news?…the races were rained out. Nonie, Jason and I left Waterdown early in the morning to be at the Central Gospel church in St. Catharines for 8:15am. The weather was cloudy and humid when we left, but no rain. By the time the first of two church services were over, the skies were sunny and it was very hot…as if it was July. In this picture some members of the congregation and guests are leaving one of the services. We were honoured to take part in this event that focused on being “ready for the race” of life. Pastor Bill Markham used all the race flags to illustrate his message of life and living God’s way. There were some beautiful classic cars parked beside our car. It may have been a blessing that Saturday nights races were rained out…I can’t beleive I said that…I can’t beleive I wrote it…but it was nice to have the car in fairly good shape for this special occasion. This week end should be awesome with the line up of entertainment at Flamboro. 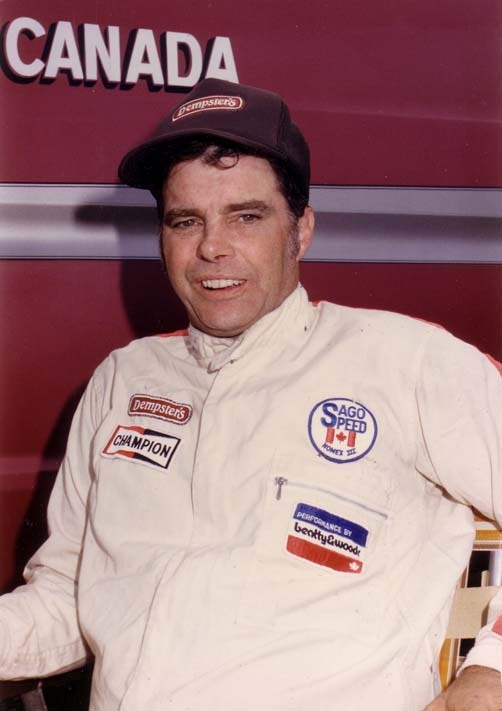 David will be there, as will many southern Ontario Late Model racers. Last year we had a great day with a pair of 2nds in both 50 lap features. It was discouraging that we were not named the Octoberfest Champ, no one was crowned the Champ in the Late Model class for the first time in many years. Our crew and family are ready to go, and perhaps my biggest fan, my Mom, is so looking forward to this weekend. She will be there for both days, she said tonight she can’t wait. She’s also planning to go to Peterborough for the Autumn Colors show. In this picture at the APC 300, David and I battle with Ohio racer #32 Glenn Gault and Ontario star #44 Steve Laking. He is one of the top runners at Lake Erie Speedway. 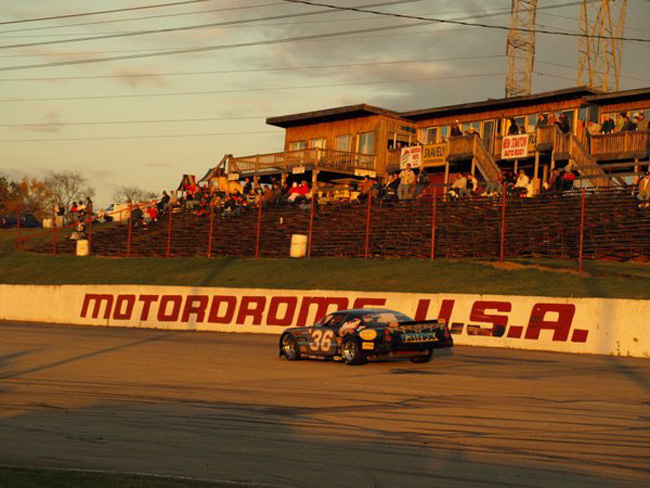 Our team is also planning to go to the MotorDrome Speedway, just outside of Pittsburg, and race against their ASA cars. Glenn may be at that show. 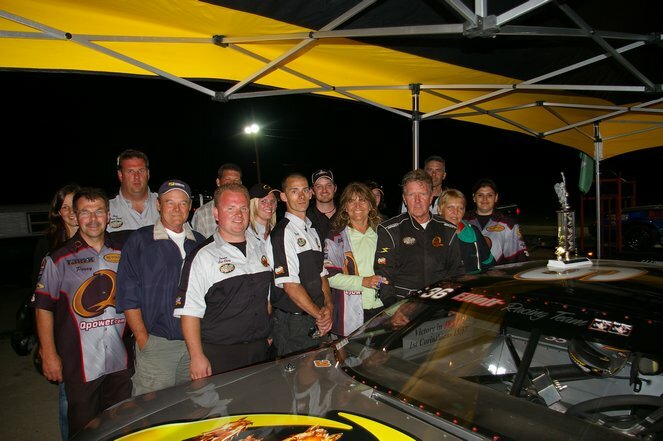 Others making the trip with us will be the race teams of Jason Shaw, Tyler Brown…oh yes and Mom. 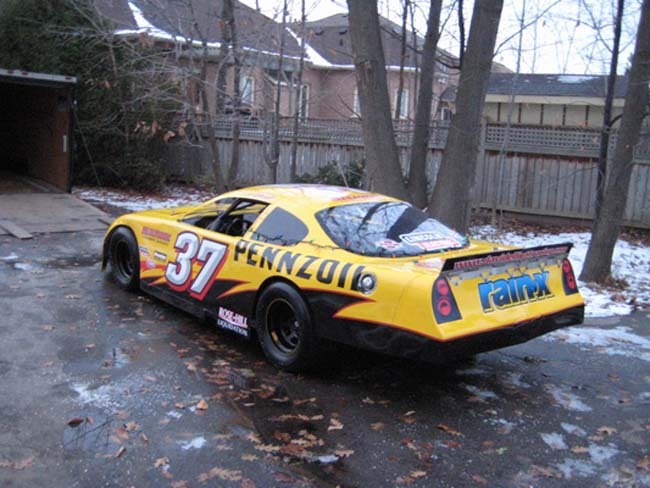 Even though there’s one night left in the Flamboro points chase, there is no way Shaw Racing will miss out on the 2008 Flamboro points chase. 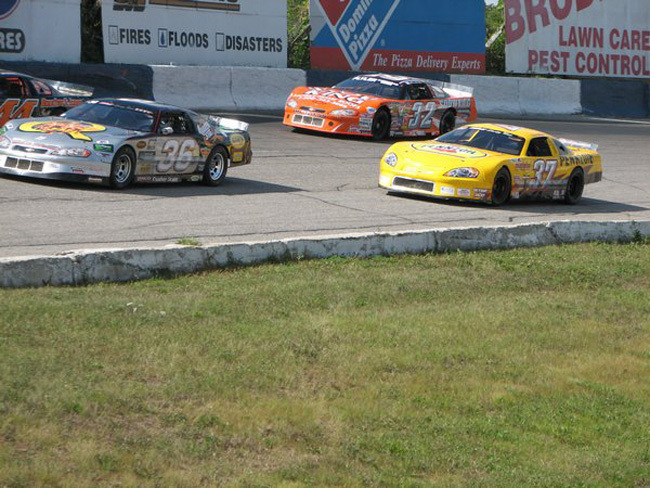 It was incorrectly announced at Flamboro, that the 27th was the last night of points. All the cars in the hunt for the title will collect 100 points next week end, no one will gain by points earned…however they could add points when they lose another drop night. The best 18 nights count for the Championship and next week will be #20. Jason has a 17 point lead over Paul Howse already. Paul has a 98 point night to drop, and Jason 92 points, so Jake will gain six more. Our team will gain on 3rd place slightly, but we’re too far behind to take the spot. Scott will finish 3rd and Richard Holmes 5th. Paul and his team deserve a lot of credit for keeping the battle close. I really think the track should have given Paul and his team more time to get out for the feature on September 20th. Surely someone in the pit tower or another staff member, could have kept watch on the #8’s progress in the pits, and let the starter or race director know Paul was on his way to the track entrance. He missed getting out by half a lap or less, resulting in his team suffering their worst night of 08′, and ultimately taking them out of the Chase. Congraulations to Richard Holmes and his team. They had their best season ever in Late Models with a 5th in the points a year that saw them pick up their first ever Late Model feature win. Our team also had a very good season, once we got into July. We will finish 4th in the points for the 3rd season in a row. 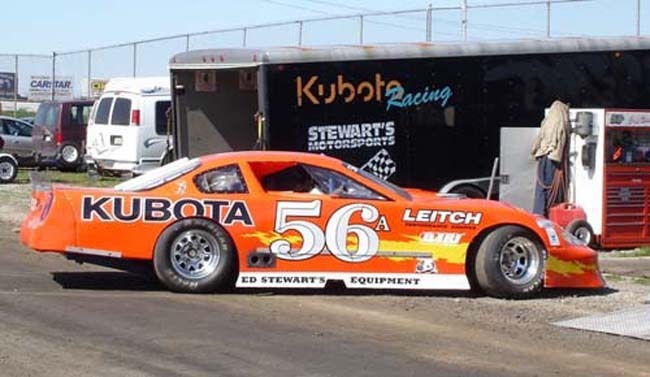 The past 10 race nights were very good for our team and I owe a lot of thanks to our sponsors and our dedicated and well prepared crew….once again…Congratulations Jason Shaw for your awesome season and 2nd Flamboro Late Model Championship in a row. What a night for these two hard chargers! Battling on the front chute something apparently broke on the #56 driven by Jeff Stewart. Jonathan was the innocent bystander in this wreck as the cars locked together resulting in hard turn one crash into the cement wall. The impact was so hard it flipped the #4 of Jonathan Urlin on his roof. Lucky both drivers escaped injury, actually, Jonathan escaped in the truck in the back ground. It was a beautiful week end for Autumn Colors. There were many happy fans at the races on Sunday, none more so than these two kids who each took home a new bike. Bryan Mercer, driver of Late Model #81, emailed me during the week asking if he could support our Giving Back Tour with a bike and we gladly said yes. Bryan didn’t make it out for the picture but his dad did as well as both the parents of the lucky kids. I think the little boy will be a few years before he gets to ride his 2 wheeler. We appreciate Bryan and his team for their support as well as all those who sponsored bikes throughout 2008. 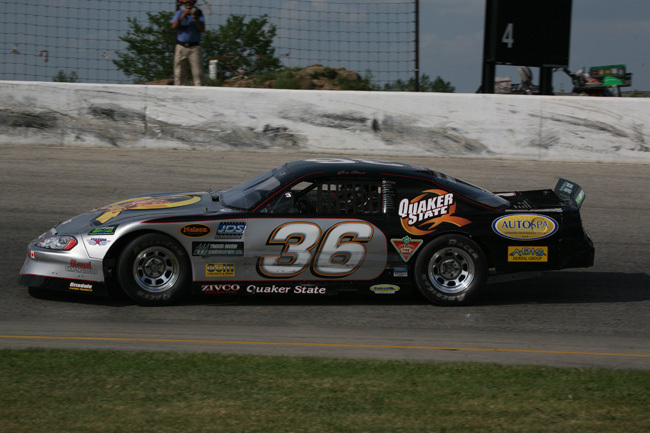 We have one more race left in the U.S. at the MotorDrome Speedway in Pennsylvannia this coming week end. We hope to give away a bike there also. Jason Shaw and Steve Laking are making the trip for the ASA 100 lapper on Saturday night. Should be an awesome way to cap off this great season. It was neat to go to Smithton Pennsylvannia to race at the MotorDrome Speedway. We went down with the Lancaster family who towed our Late Model. The track staff and every racer I had the chance to talk to or ask questions, was very friendly. They were nice on the track to, never hit me once and that was surprising because I should have had my 4-way flashers on, I was way out of my league with these ASA cars, but we tried our best, all of us. Jason and Steve ran fairly respectable. Steve getting a 3rd in his heat and Jason a 5th. Their luck ran out in the feature when Jake wrecked on lap one and Steve later in the race with a terrible crash on the front chute. Jamie Ramsay, a strong runner from Delaware Speedway also came down and would end up with the best finish, 14th, although several laps down. We finished 18th, leaving the track with an oil leak at lap 68 of 100. We were 4 laps down when our differntial started to leak. The highlite for us Canuks was giving away these two bikes to an Amercian boy and girl. Steve and Jason’s team provided one of the bikes for the giveaway. Read the full report on our Message board on the topic entitled “Diary OF A Season”. We did have a great trip down and back even though we brought a slingshot to a nuclear war…as Ron Shaw always use to say “Are we having fun yet”? Well, as out classed as we were it was a fun trip and a great time with some awesome people. Right!…but we did burn up a set of new tires. This track is so fast the rubber melting off the tires was wrapped around our fender support bars like spaghetti. The full race report of this fiasco is on our message board, under Diary Of A Season. This picture was taken by one of Jason Shaw’s crew members, Denise Reed. I wanted a picture with the tracks name in the back ground. Sadly for our stats, it will be in remembrance of the track we got beat up the worst. The good news, and when your not in the hunt…in the hunt? are you kidding…anyway, the best thing is to try not to get wrecked. We got beat up by the super strong ASA cars, other than that the car is like new except for the black streaks all over the body from the melting liquid lava from the Hoosier 10″ tires. Hey at least we were fast enough to melt the tires. The people at MotorDrome weer very friendly, staff and drivers. No matter how much I go on our poor showing, we still had fun……nice picture, thanks Denise. 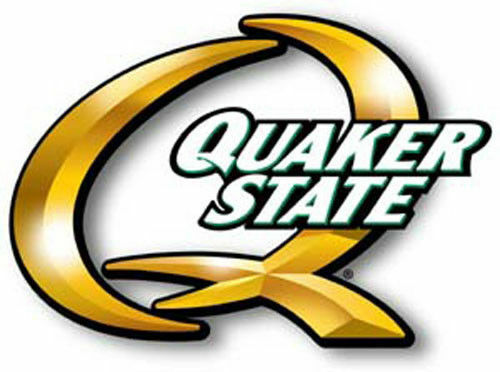 Coming up I-79 Nonie saw the sign “Quaker Steak & Lube”, she suggested “we can go there for lunch”. No kidding!!! We heard of this place before but didn’t know exactly where it was. So, wanting to make the best of our race week end, Nonie, Art, Jeff, Jason and I just had to stop at this famous restaurant near Erie. Inside were all kinds of racing things to see. Sprint cars and dragsters hanging from the ceiling. A classic Corvette and a 55 T-Bird sitting on 4 post hoists, both in the eating area. There was a NASCAR cup car sitting outside. It wasn’t race ready. We could identify with that guy, especially after our showing against the ASA rockets. Anyway, if you’re in the area, take your camera and get some shots inside this neat place to eat….PS..no they don’t cook with Quaker State oil, I checked it out. It’s the first ever Frost Fest at Flamboro Speedway on Sunday November 2nd. 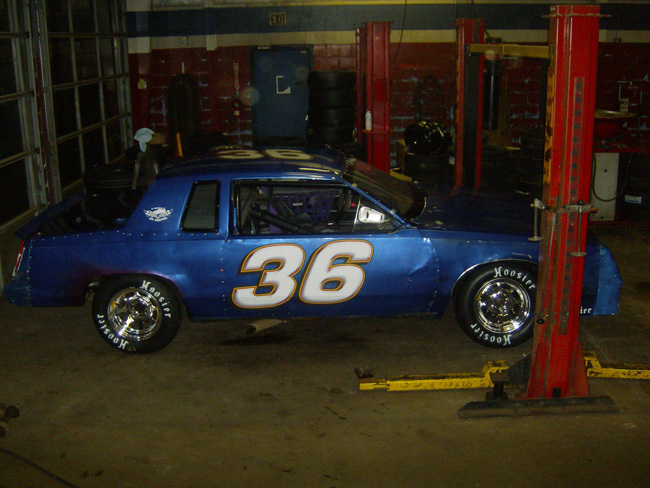 We’ll be running this Olds Cutlass against TC champ Randy Rusnell and the rest of the stars of the Thunder Car class. After a nasty outing in Pittsburgh we’re hoping to be a little more competitive with the TC boys and girls, but they know their stuff and have the fast lane figured out, so we enter their arena knowing we may be out gunned. This is kind of a shake down for my partner Mike Van Slingerland, who will drive this car next season. I am very thankful to Mike, Art, Jeff, and Jason Lancaster, my own crew, Jim, Jason, Perry and Troy, and the #5 team of Linda Dean and Ken Stenhouse for helping get me pointed in the right direction. Our crew are so looking forward to this last race of 08 and the weatherman is forecasting a great day. This will be race night #27 for our team, the most race nights in over a decade, but a long ways from 1990, when we ran 39 nights in our Hobby Coupe. 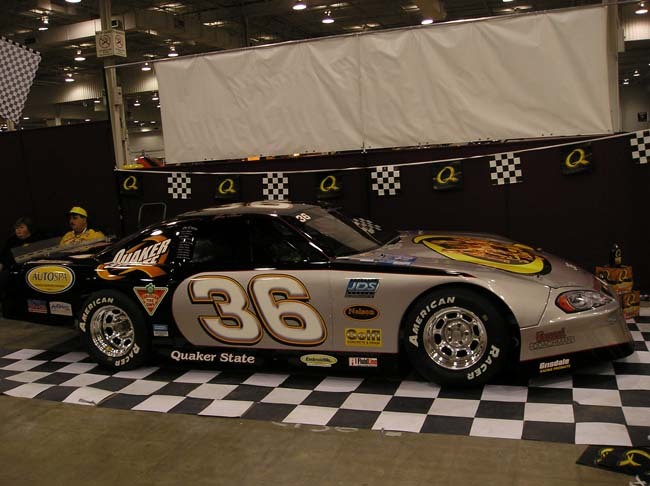 Once this race event is over, we will be announcing our plans for 2009 that will include this Oldsmobile. I have never raced a Thunder Car before, can’t wait. Jim, Jason, Perry, Marty and I headed to Beamsville on Saturday to the St. Annes community church for the Faith Mission’s annual Father & Son sports breakfast. We had our Late Model on display, even got to start it up for the kids, big and small. This was our last commitment before taking the Monte Carlo apart and preparing it for the 2009 race season. It was a great day with over 75 fathers and sons in attendance. After unloading the LM we loaded the Thunder Car to head to Flamboro for practice. The race is Sunday, triple 50 lappers. Oh, there’s a dance Saturday night at the track…bring your long underwear, tooke and heavy coats!! !….forget that….bring your fireplace. We took our Late Model to St. Annes church on Saturday November 1st for their annual father and son breakfast. I had the privilege and honour of being the guest speaker for this special event. Many young boys got a chance to sit in the car. For added effect we started the 400 HP Crate engine that immediately brought smiles from all the kids big and small. Jim, Jason, Perry and Marty, from David’s team, were there to lend support. This was our final show for 2008. We plan to have our 40th Anniversary car completely stripped by the end of this week and on Monday November 10th Mike McColl will give it a once over as we begin preparation for 2009. Was I Suppose To Retire? On August 17th we bought the #91 Late Model from Darrell Brown. Within a week of that deal our team expanded to four cars after the puchase of the Thunder Car. Soon after our team forged a solid friendship with Art, Jeff and Jason Lancaster. 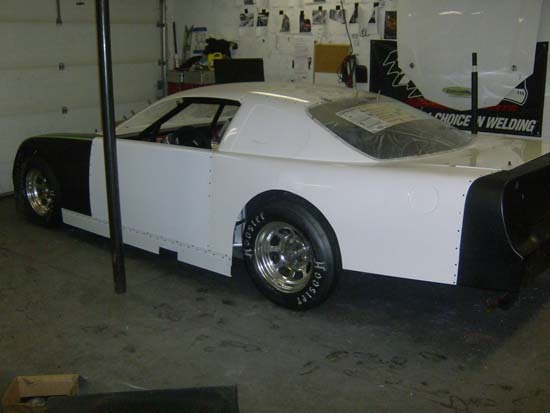 The plans for 2009 are to run our new Late Model on Friday nights at Delaware Speedway. David and I will team up to take a run at the Delaware Championship. Our new car will be #9. Jeff will drive the #9 Late Model at Flamboro on Saturdays. 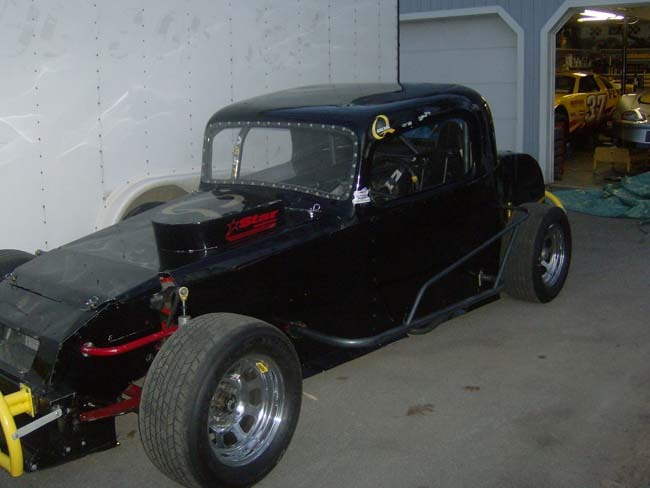 Jason will pilot the Vintage Modified and Mike Van Slingerland will make his rookie debut in the Thunder Car. This opportunity was made possible by many fortunate events coming togeter including a new sponsor whom we will announce soon. 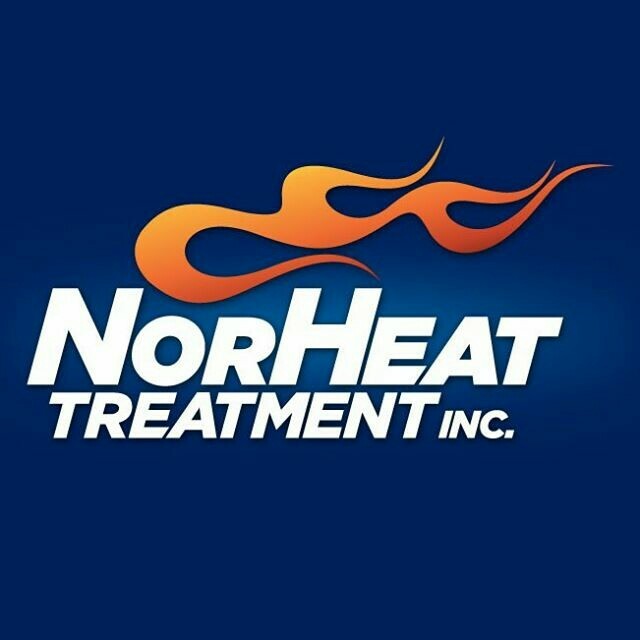 The full story on this merger is on our message board under the topic “Four Car Team”. We are currently working on the two Late Models and will show the progress of them as they unfold. I’ve worked with many enthusiastic people over the years, but none more excited about racing than the Lancaster family. As well Mike is very pumped at the thought of competing in the Thunder Car class. Lucky for me my crew have accepted this additional racing in a very positive way. 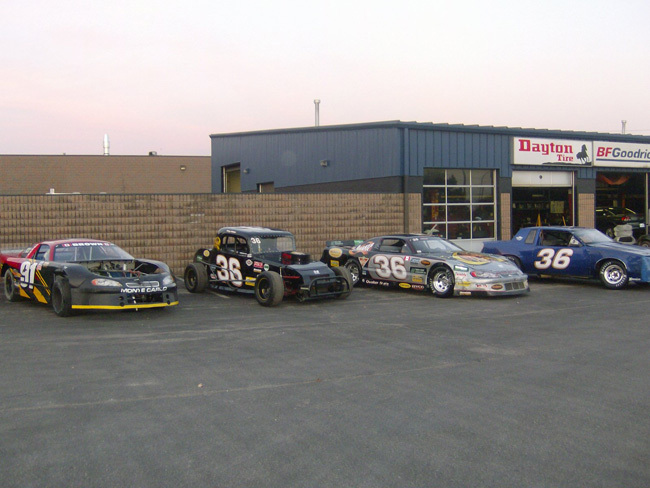 We ran 26 Late Model shows in 08, our busiest Late Model season so far. Next year promises to have more shows for our team but the extra support we’ll get from the Lancaster family will help us make 2009 an exciting adventure. Our family has been saddened by the loss of my uncle Percy Elliott, far right standing behind his good friend Roger Peach, who passed away in 2004. 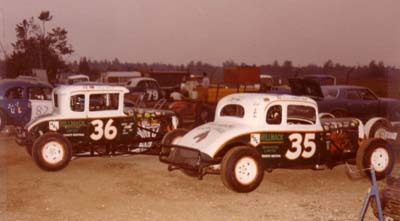 Uncle Percy never missed a Hobby race when we ran at Sunset. He always had good things to say no matter how I ran, always encouraging me. He got the most excited when we won, making this picture even more special because he came down to get in the victory lane shot. David and I always ran well at Sunset, a track he could make every time we raced because it was so close to his house. He usually came with his son Don, daughter Kim and their children. Many times, like on this night, his grandchildren would come with him to the races, and on this special night, they got in the photo with their Papa. He was incredibly gracious to me all my life, starting in my early childhood. We use to call each other before the Leaf games back in the early 60’s when Hockey Night In Canada came on half way through the second period. I always took the Leafs unless the Rangers were playing them, and then of course I cheered for my hero #9 Andy Bathgate. Uncle Percy asked me one time “Who’s purple and plays hockey”? I had no idea…he said “Andy Bathgrape”! Then he hugged me knowing I didn’t like him making fun of my favourite player. Usually we would try to guess the score of the game and call each other again if something special happened or we were right on our predictions. On a few occasions he supported me when I needed someone to take me to an outing. Once he acted as my dad for the Boy Scouts Father and Son banquet. The day this picture was taken, we stopped at his home just south of Cookstown to play horseshoes with our daughter Shirley and Roger Peach. He was unbeatable. Stopping at his home was a ritual we had to do in the afternoon prior to our race at Sunset. Our family has been so blessed with music and uncle Percy was an awesome piano player, making two LP’s with his brothers playing down home fiddle music. A few weeks ago he went to Nova Scotia to spend some time with two of his brothers and two of his sisters. On November 7th they were playing music, fiddles, guitars and uncle Percy on the piano, just like they did a thousand times. Uncle Carl, his brother, said he played incredible that night. Then suddenly uncle Percy collapsed. He was rushed to the hospital. On November 17th, with his son and daughter in his room and all of his grand children giving him their love on the phone, he left this life to receive the checker flag of eternal life, the one he received through faith in Jesus Christ. I am so thankful to have known this humble loving gracious man, and am proud to have called him my uncle. Thank you dear Uncle for leaving so many good memories, we’ll miss you, but we won’t ever forget you and for sure we’ll see you again. It seems impossible to think there would be something our team has never done or tried in forty years of racing. Well, it happened. It’s not the black chassis, we use to paint our Hobby frames and roll cages black in the 70’s and early 80’s with Tremclad paint. This year our frame is again black, the first time in over 25 years…but it’s “powder coated”. The process is quite amazing and the results are excellent. We thought about doing this before after seeing the amazing finish on Mike Podds powder coated #5 CVM. Our chassis was sent to Mike McColl for repairs. Then taken to Teff Line in Burlington, where it was sand blasted and powder coated, a process that took the chassis to 400 degrees. I waited outside. It was a little expensive, but we’re glad we got it done. We started working on our car right after our appearance at St. Annes church on November 1st. A month a half later and here we are, ready for paint. The car had some serious maintenance done to make sure it was in good shape to take a run at dethroning Jason Shaw, no easy task for anyone. We had the quick change tore down and rebuilt by Junior Hanley. He also rebuilt all our shocks. Mike McColl repaired the bent chassis parts, although the frame was perfect when put on the jig. We built our own new style front and rear bumpers and mounted a new body, less roof. The chassis was sent out for powder coating, a first for our team. Every part of our car was cleaned and inspected before they were put back on. Many people helped get our car to the place you see it in this picture and they deserve special thanks. Our own crew, Jim, Jason, Perry and Troy. The Lancaster family Art, Jeff and Jason. Finally Pastor Mike, Andrew and our newest crew member Tracey. The car will be ready for lettering before Christmas, but not sent out until January. At that time I’ll figure a way to drive Steve Lyons nuts with the lettering scheme. Steve will put his masterful touch to accent Jim’s excellent paint job. 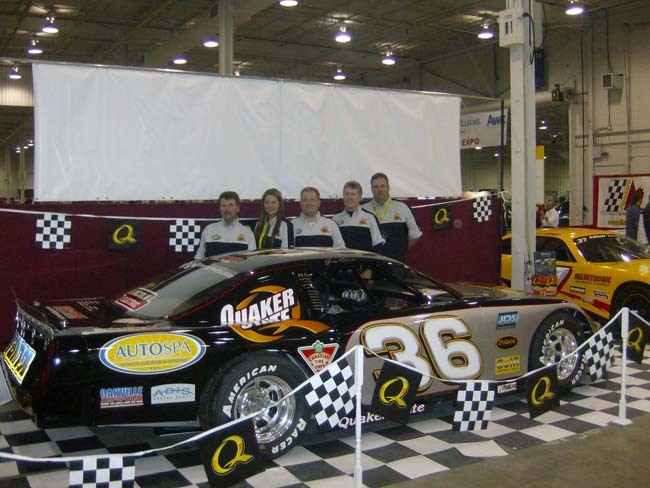 We won Best Appearing Car in 08′, thanks to Jim and Steve, and our own efforts to keep the car looking great every week. We have a new look planned for 2009 and we need to try to make the car look a little different, maybe better than it did in 08’….at least as good as it did last year. It may seem we are ahead of schedule…trust me, we’re a long way from being ready for racing. Our racing team will be making an announcement very shortly, stayed tuned. 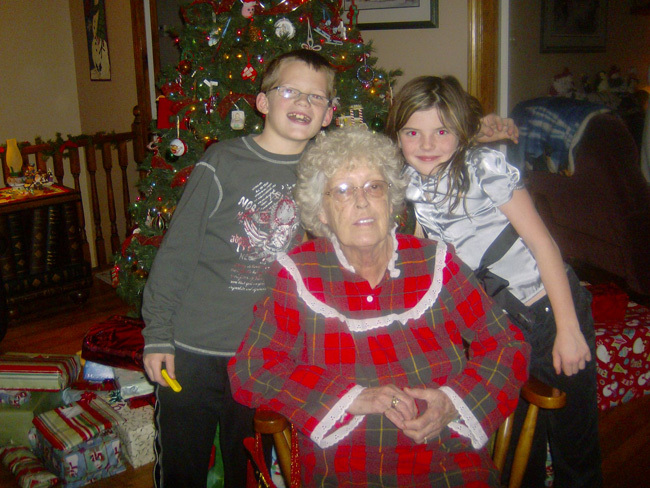 Grandma Elliott gets a picture with two of her four great grand children. We’re about to watch “Polar Express” in 3D, then we’ll head to bed and wake up hopefully long after day light. Knowing these little ones, the anticipation of us making it past 6 am will be a bonus. The excitement will be too much, for them and for us. Perhaps the most excited people were those who experienced the first Christmas eve, those shepherds who were just doing their duty on a hillside near Bethlehem when the sky suddenly lit up by the presence of the Angel of the Lord, who came to proclaim the birth of Christ the Lord. That story’s in the Bible, in the 3rd book of the New Testament, Luke chapter 2. If you get a chance, read verses 8 to 19 and feel the excitement those shepherds did on that awesome night….Merry Christmas.